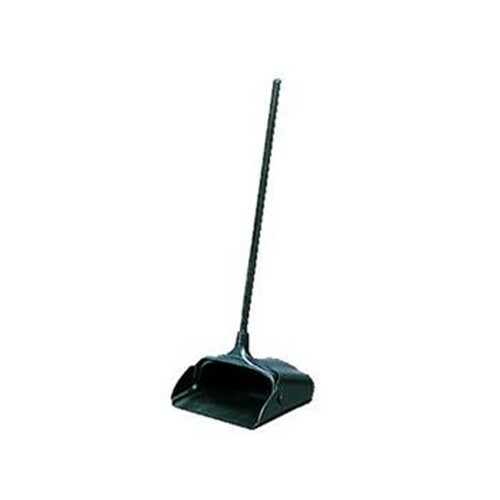 Rubbermaid Lobby Pro Upright Dust Pan, RUB2531BK, 086876174809, is an open style vinyl coated, metal handle dust pan. Built in recess on the back of the pan allows emptying without touching the pan bottom. Yoke and handle assembly features larger, quieter hinge pins. Wheels and wear pads on the back of the pan provide long product life. Lightweight plastic construction reduces the risk of back strain. The dust pan is 11.3in W by 5in H by 12.5in L. Overall height 37in. Sold each. Lightweight plastic construction reduces the risk of back strain. Size: 2in. wide dust bin. Overall height 37in.